When someone says, “evicted”, do you picture notices posted on doors, courtrooms with stern judges, and piles of your tenant's abandoned junk? Those are realistic features of what can be a very unpleasant experience. But have you ever thought about eviction in terms of the actual price tag? 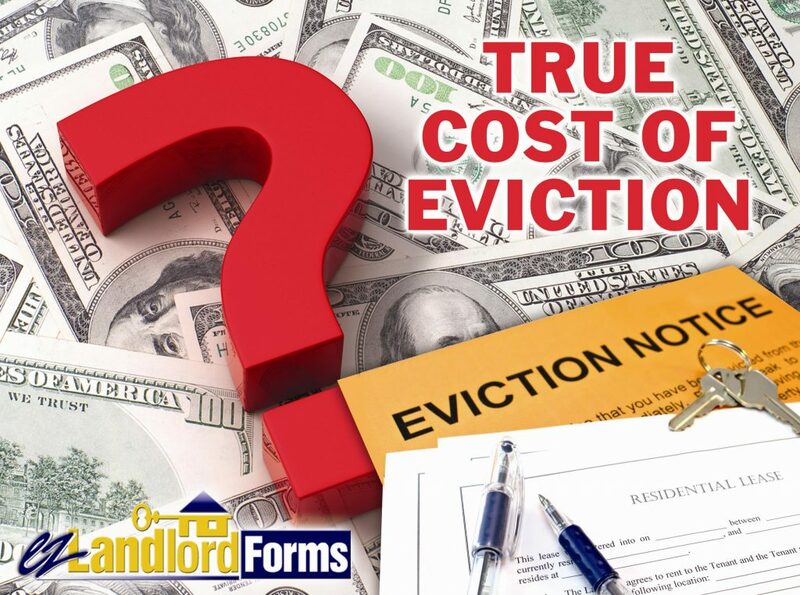 The legal fees, the court costs, lost rental income, and other damages that turn an unpleasant experience into a landlord's horror story? At a minimum, you could spend $2,500 on one eviction. Court fees: The cost to file court actions varies from state to state, but all charge for filing. In Florida, for example, fees for filing, issuing a summons and serving two defendants start at $275. Filing subsequent actions, such as a summons or a demand for a jury trial, brings additional fees. Property damages: The cost to haul away trash and abandoned possessions, with surcharges for handling electronics and hazardous materials, can start at $100 a load. Sadly, some evicted tenants have turned vicious and left expensive messes in their wake, boosting clean-up costs into the thousands of dollars. Financial damages: Landlords who win eviction cases still have to collect. Many claim there's little hope of collecting back rent and/or damages from a tenant who couldn't manage to meet regular rent obligations. Lost rent: Eviction can take between five weeks and three months. With rents in the U.S. averaging $1,350 a month (they run at an average of $939 a month in Canada) lost rent in the U.S could be between $1,570 and $4,050 (between $1,092 and $2,817 in Canada). Best way to deal with evictions? Avoid them! Alfred Hitchcock, the master of horror and suspense, once described his own aversion to the unknown. “I'm full of fears and I do my best to avoid difficulties and any kind of complications. I like everything around me to be clear as crystal and completely calm,” Hitchcock said. He could have been talking about landlords! The easiest and best way for a landlord to avoid difficulties and complications is to have a good, written lease and to thoroughly screen tenants. A credit check and criminal background report is vital in order to decide whether to lease property to an applicant. Landlords must know whether a court has ruled against an applicant in previous eviction cases, and whether that applicant's credit is good or in ruins. Otherwise, it's a roll of the dice. Is eviction the only way to regain possession of your rental? Some landlords, when faced with tenants who have broken the lease agreement, find success with the so-called cash-for-keys alternative to filing for eviction. In this scenario, the landlord offers the tenant a sum to immediately move out of the unit. The rationale for some landlords is that the tenant who's behind on rent is unlikely to have the money to pay a judgment against him of her. Eviction isn't likely to help the landlord recover losses, and the tenant may remain in the unit throughout the sometimes lengthy eviction process. However, cash-for-keys isn't a measure you want to try without an attorney's advice and guidance. The worst thing any landlord can do is dither. Too often, an inexperienced landlord will delay launching the eviction process because the tenant promises to get caught up on rent or remedy other lease violations. Then, the deadline to catch up passes and the tenant makes yet another promise that the landlord hopes will be honored. Sound familiar? Well, instead of hoping, savvy landlords and property managers immediately send tenants a notice of violation that warns of the potential for eviction. This way, when the deadline arrives, the landlord can go right to the next step. If the tenant responds positively – that is, pays back rent and fees or cures other lease violations – then the landlord doesn't need to take the next step. Eviction isn't pretty and even the most careful landlords must occasionally evict tenants. But doing all that you can in advance is still the best precaution against finding yourself in that difficult and complicated – and costly – process. More rumors surround the subject of eviction than perhaps any other rental topic. Landlords and tenants alike seem to rely on word-of-mouth information, which seems rather inappropriate considering that the eviction process follows fixed guidelines. States and local municipalities set these guidelines, and very few are identical. One feature of virtually all eviction laws is a requirement that landlords give tenants written notices before filing eviction court cases. This is where things get confusing. It takes more than a notice from a landlord for a situation to become an eviction case. A complaint must be filed in court for a case to be officially recorded. Even after a case is recorded, the outcome is not necessarily that a tenant will be evicted. There’s nothing fiercer than a momma protecting her young, and this goes for birds as well as humans. 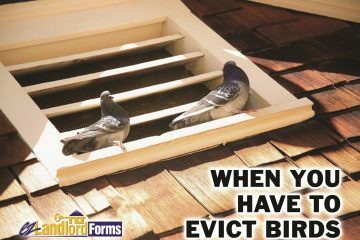 And, while society’s view of animals - especially pets - has seen a remarkable shift in recent decades, the age-old conflict of unwelcome birds occupying man’s roof eaves, dryer ducts, and stove fan vents continues. It’s no fun having to dislodge a nest of invasive English House Sparrows, let alone beautiful natives like Purple Martins, Chimney Swifts, Red-Headed Woodpeckers and Mourning Doves. The hatchlings shriek and the momma dive-bombs, and falling off a ladder becomes a distinct possibility. Your new tenant just moved into your rental unit. He seems like a great guy. He has a sterling credit record and great references. The security deposit and first month’s rent check came two days early. Not only that, when you stopped by to drop off an extra set of keys, the grass was already mowed, and the house looked cleaner than when he moved in! Well, it’s time to get an eviction plan in place. That’s right. It is time to list the specific measures you’ll take to evict Mr. Perfect Tenant if the time comes. 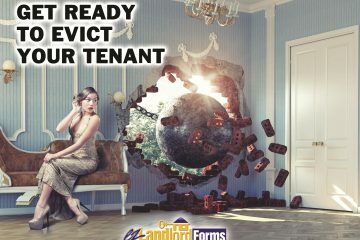 That’s because no matter how wonderful your tenant now seems, things can turn bad. No one wants that to happen, but, when a tenant breaks the rules, you can’t afford to lose time researching the next step.